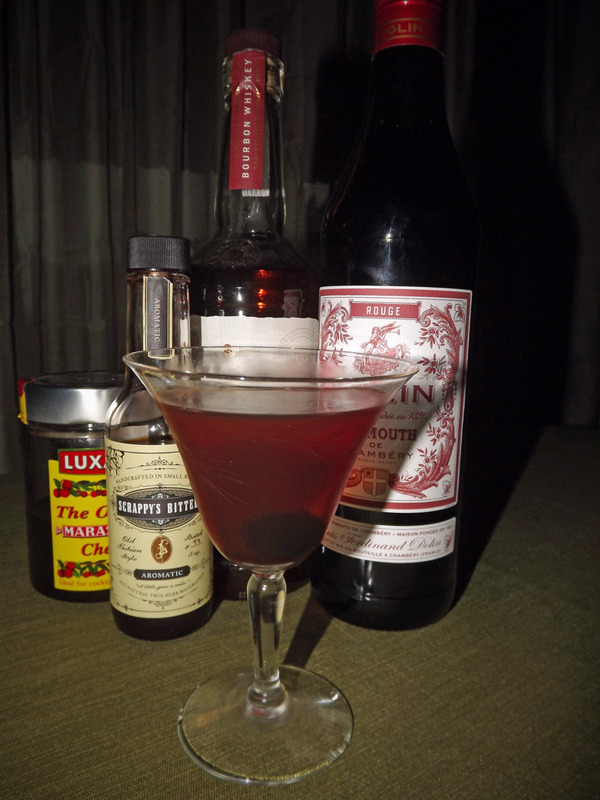 Looking back through the blog recently, I was shocked to find that I hadn’t made a single Manhattan in the nearly 4 years since starting this page. I have had no excuse to ignore this quintessential classic cocktail, so I apologize for my oversight. The Manhattan is said to have first been made (or at least) introduced in the United States by the request of Winston Churchill’s Mother in a bar in NYC. Since those days the drink has become a true classic recipe known by even the most humble of bartenders. Plus it’s a great example of how a truly masculine drink can be presented in a fancy cocktail glass. For a drink this simple if you’re not using quality ingredients you’ll be doing yourself and your guests a disservice. A cheap whiskey (traditionally bourbon or rye) will be far too harsh on the palette, while a cheap vermouth will leave quite literally a bad taste in your mouth. No, a good Manhattan is all about the right ingredients all coming together beautifully. With a deep reddish brown color and garnished cherry this drink feels both classy and intimidating at the same time. With sweet vermouth on the forward aroma, it’s is as inviting to the senses as such a simple cocktail can be. Masked by the mixing of flavors you’re greeted with a pleasant mellow bourbon on the front of your palette. It quickly moves into the vermouth (again get a good one, you’ll thank me), and leads to an oaky bourbon and bitter finish. If you chose rye over the bourbon I imagine you’ll get of its flavor than you do the oak of your favorite bourbon. The bite is strong, but the flavor keeps you coming back for more! It’s hard to hate a drink like this (unless of course you’re not a whiskey lover). Stir with ice for about 45 seconds. Strain into a chilled cocktail glass, and garnish with a maraschino cherry. I’m back in the new year for a classic cocktail that in many ways isn’t even a cocktail. The Mint Julep is basically just an excuse to drink 4 ounces of Kentucky straight bourbon. Not that you really need a good excuse, but either way it’s one of those drinks that’s perfect as long as you buy the right product. 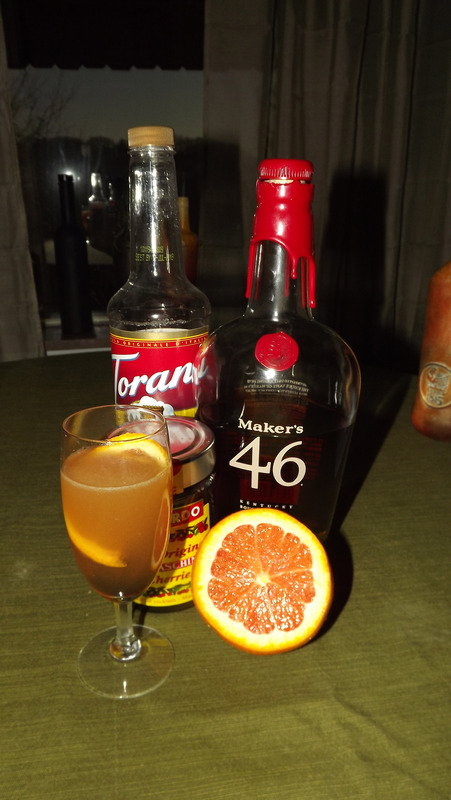 Pick up your favorite bourbon and make this sometime. Need a suggestion on which one? 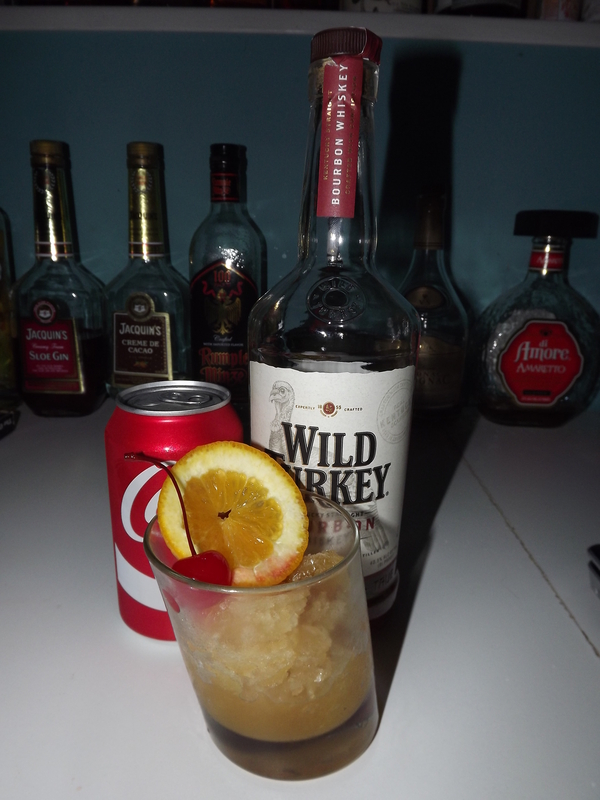 Old Granddad, Wild Turkey, or Makers Mark. Ok? Good. Now drink up. 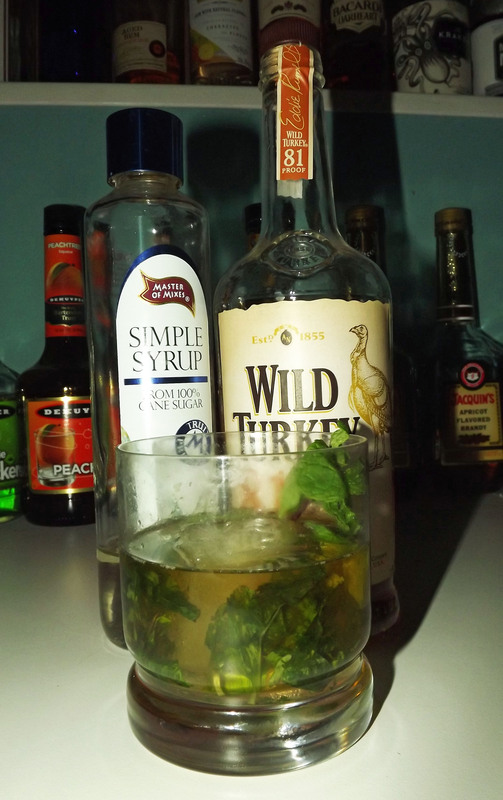 Muddle mint leaves and simple syrup in the bottom of a tumbler glass. Add ice and bourbon. Stir well. Garnish with 1 or 2 mint springs. I realize it might seem a bit redundant to say “Frozen Blizzard” but it it important to note that this drink can be make shaken with ice, or blended with it. The drink also calls for 3 ounces of bourbon or blended whiskey which are two very different categories of whiskey which could shift the drink to either side of the taste spectrum. For this variation I decided to mix both the blended whiskey and the bourbon for a more well rounded taste (and also because my bourbon is 100 proof). The drink has a strong and unblemished whiskey aroma which to any lover of the spirit is quite welcoming. This unique blended cocktail starts off a little sour, then leaves you with a tart whiskey taste on the mid palette and the finish. I do think the drink lacks a bit of flavor complexity despite the mixing of blended whiskey and bourbon. However, if you’re looking for something to blend that isn’t a vodka or rum based drink, this is well worth the try. Combine all ingredients in a blender with 1/2 cup of ice. Pour into a tumbler or wine glass. Garnish with a lemon slice (wheel). Well this is certainly an interesting drink for my return from another blog hiatus. 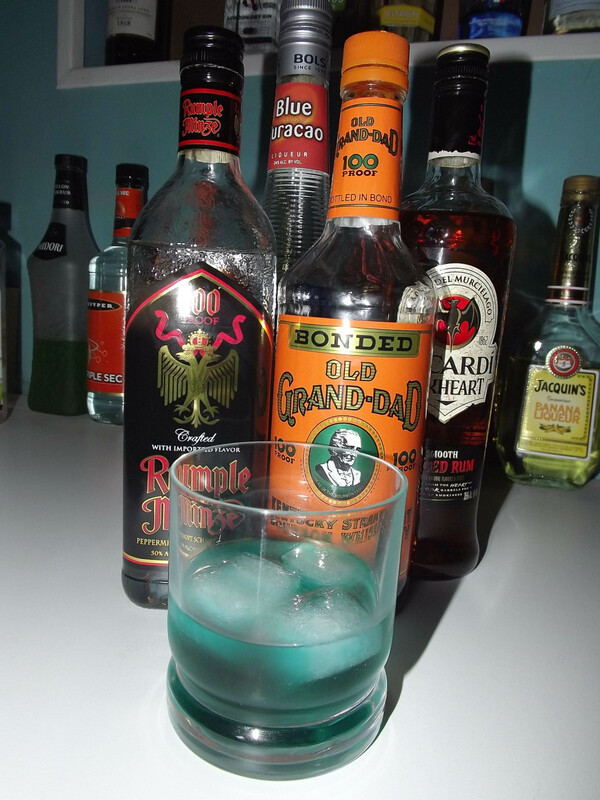 The “Flaming Blue Blaster” starts out by breaking a simple rule of mixology: “Don’t shake drinks that are alcohol only. Stir them.” NOPE we’re shaking this drink for some weird reason. An interesting blue-green color starts you off questioning what is even in this drink (besides curacao). You’re greeting with a pleasant peppermint aroma, with a subtle note of oaky bourbon. The drink starts out sweet and tangy thanks to the curacao, it moves to an oaky alcohol taste in the middle (thanks to the Oakheart Rum, and if finishes in two segments; first a bourbon taste then a refreshing mint. 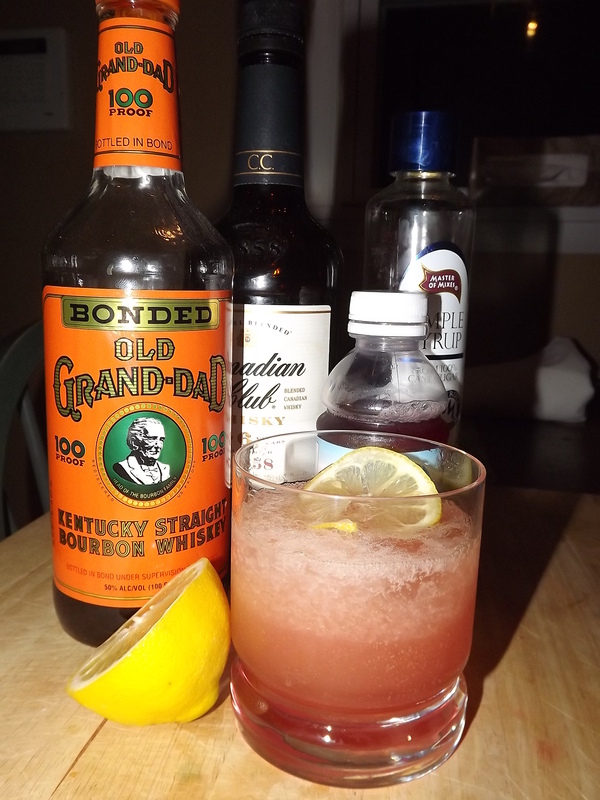 I think my use of both the 100 proof bourbon and 100 proof schnapps for this drink fit the name quite well. For a less intense variation you could easily move to a more moderately proofed variation of either. Even with the intense flavor and proof components it’s still a very good drink and not too overpowering. I’d recommend giving this one a try for a slow sipper style cocktail. Shake and strain with ice. Strain into an iced tumbler.